The IS sedan is the lightweight and affordable sports entry in the Lexus lineup, focused on drawing performance-oriented customers to the brand without breaking the bank. Compared to other comfy and luxury Lexus vehicles like the ES and the RX, practicality has been traded for nimbleness and a low, sleek profile. Power is presented through the 2.0-liter turbo-charged inline-four engine, with Variable Valve Timing-intelligent Wide (VVT-iW) on intake valves, and eight-speed Sport Direct-Shift transmission with steering wheel-mounted paddle shifters. The engine provides 241 horsepower and 258 lb.-ft. of torque, which enables a quick sprint from 0 to 60 in 6.9 seconds. The EPA fuel economy is 22 mpg city and 32 mpg highway for a combined 26 mpg. Balancing between optimal fuel economy and raw power is the Drive Mode Select, which gives the driver ECO, Normal, Sport, and Snow modes. ECO mode was my single choice for the test drive. The outside of the IS is an attention-getter. The aggressive front fascia starts the admiration. LED headlamps and stand out tail lights draw the attention of the viewer and often a crowd. The showboat, muscular stance fed by sculpted lines showcase the rear wheels’ arches and the sweeping taillights. The dual exhaust in chrome leaves a lasting impression. The IS rests on 17-inch aluminum wheels wrapped in all-season tires, with a tire pressure monitor system to keep you safe. The Adaptive Front Lightning System reads the steering angle and speed sensors, and appropriately tilts the low headlamps to illuminate around the corner as the vehicle takes on a curve. I found this a wonderful technology whether driving on rural roads, into a large congested parking lot, or down narrow city streets lined with closely parked cars. The advanced driver-centric cockpit empowers the seat behind the wheel as the absolute throne, possessing full authority over the tech and the drive. The low-set, 10-way power-adjustable driver’s seat with lumbar support, and the eight-way power-adjustable front passenger’s seat are priceless when it comes to comfort. The standard dual-zone climate-control system features individual settings to allow the driver and front-seat passenger to adjust for their individual preference. My wife likes it warmer, I like it a lot cooler, and the dual zone solves the temperature issue. The IS 300 is packed with technology. 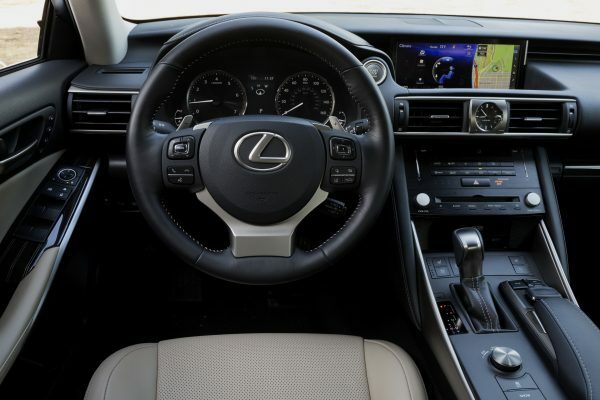 The list of communication features is long: Lexus Display Audio, Siri Eyes-Free, Bluetooth hands-free phone and audio streaming, Lexus Premium Display Audio System, AM/FM/CD with MP3/WMA player, HD Radio with real-time traffic and weather, Gracenote-Album Art, USB ports, and integrated SiriusXM Satellite Radio. The feature I found the most useful was the weather information. On two occasions in one week, the weather changed dramatically in just a short time as we traveled. The radar picked up the storm clouds and where the hard rain was falling, allowing us to find a way around the storm. Updates on traffic and road conditions up ahead (flooding or road closed) were constantly given to help us find the best route to reach our destination safely. On the safety front, standard Lexus Safety System+ includes Pre-Collision System with Pedestrian Detection, Dynamic Radar Cruise Control, Lane-Departure Alert with Steering Assist, and Intelligent High-Beam Headlamps. All this technology is commanded through the 7- or 10.3-inch color multi-information display, which displays media, navigation, and driving information. There is a downside to packing tremendous technology into a car with a sporty theme, and that is the shortage of front cabin storage. In the IS, the armrest center box is very small and a challenge to open. It’s nearly impossible for the driver to view inside and keep his eyes on the road. Nevertheless, the Lexus IS commands the road in style. It’s sporty in personality and loaded with stealth bomber technology. It is a vehicle bathed in a pedigree of comfort and work ethics while mustering the excitement of parenting the episodes of twin boys. 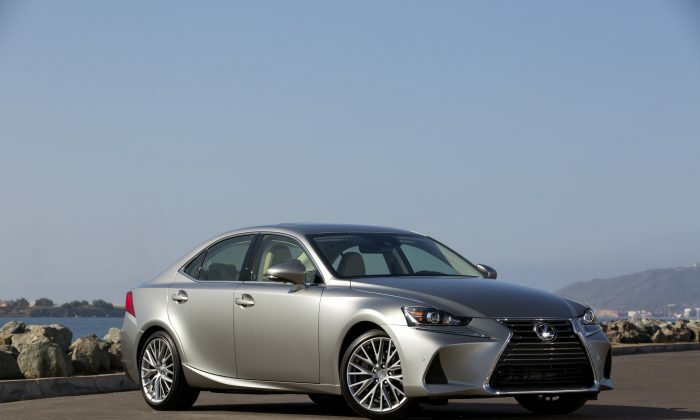 The Lexus IS 300 drives like a million bucks, but the MSRP is only $38,210. Plus it has the highest in customer satisfaction with dealer service among luxury brands, according to JD Powers. Durhl Caussey writes a car column read around the world. He may be reached at this paper or at dcaussey@sbcglobal.net.